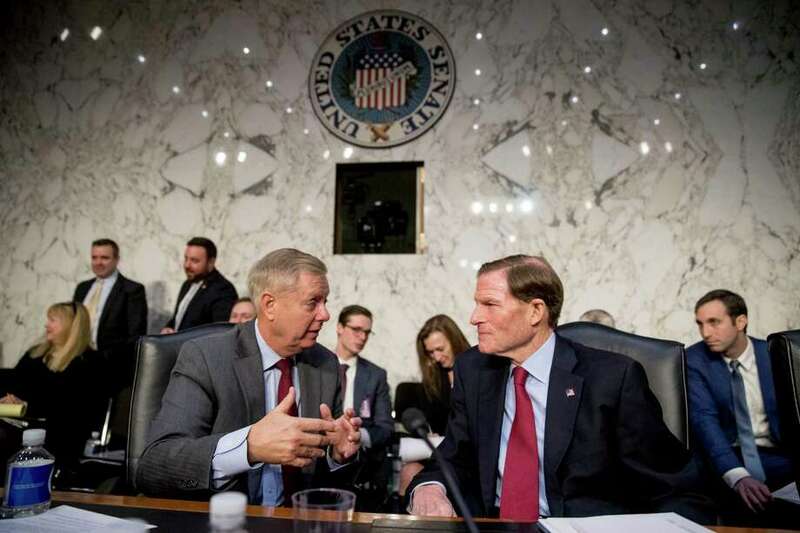 WASHINGTON — Sen. Richard Blumenthal and President Donald Trump’s nominee for attorney general, William Barr, got into a series of testy exchanges Tuesday over the scope of special counsel Robert Mueller’s investigation of alleged Trump 2016 campaign contacts with Russia, and whether Mueller’s final full report would be publicly available. The questions and answers over 10 minutes covered some hair-splitting legal questions, hardly surprising for a former Connecticut state attorney general probing a former U.S. attorney general. Barr served as attorney general in the early 1990s under President George H.W. Bush. Barr told the committee that at age 68, he has little to fear in acting independently of Trump and the White House. Trump fired the previous occupant of the office, Jeff Sessions, principally because Sessions recused himself from oversight of Mueller’s probe. Barr stated that Mueller should be allowed to conclude his investigation. He told Blumenthal and other senators on the GOP-dominated panel that he considered Mueller a friend, harkening back to their days together in the Justice Department under the first President Bush. Mueller is a “straight shooter and should be treated as such,” Barr said. But he said he would not recuse himself from overseeing Mueller until he is confirmed and sworn in and has a chance to discuss it with other Justice Department officials. Barr also answered questions about memos he authored, including one in which he appeared to question Mueller’s pursuit of an obstruction-of-justice case against Trump. Although Barr’s willingness to buck Trump was the main topic during the first day of a two-day confirmation hearing before the Senate Judiciary Committee, the Q&A also ranged into other areas including prison-sentencing reform, immigration, marijuana law enforcement and the future of Roe v. Wade, the 1973 Supreme Court ruling that undergirds legal abortion. But he said he had not made up his mind whether to vote for his confirmation. While Barr has drawn fire from Democrats over his expansive views of presidential power, others have argued that Barr may be the best nominee anyone could expect from a president as legally besieged as Trump. Barr is Manhattan native, but he has family connections to Colebrook, Conn. His parents had a home there. His father, Donald Barr, was a deeply conservative headmaster of the Dalton School in New York and the Hackley School in Tarrytown, N.Y. in the 1960s and 1970s. Blumenthal crossed swords early in his questioning when he labeled as “stomach churning” news reports of the FBI investigating Trump as a possible asset of Russia after Trump fired FBI Director James Comey in May 2017. “What is stomach churning about that?” Barr said after determining to which reports Blumenthal was referring. Blumenthal, facing a time limit, moved on to questions about whether Barr would black out portions of Mueller’s final report and, if so, would he explain the editing to Congress. Blumenthal attempted to nail Barr down on whether Mueller’s probe could be hampered by a “red line” laid down by Trump — such as putting the real-estate mogul’s personal finances off limits. Blumenthal also asked whether Barr would impose restrictions on other federal prosecutors, such as the U.S. attorney in Manhattan overseeing the case against former Trump lawyer Michael Cohen, who brokered deals on Trump’s behalf to secure the silence of women with whom he’d have affairs. Manafort, Trump’s one-time campaign manager, pleaded guilty to charges of tax fraud and money laundering in connection with his representation of a pro-Russia party in Ukraine. The New Britain native is now in a legal tussle with Mueller over his agreement to cooperate with the special counsel in pleading guilty.